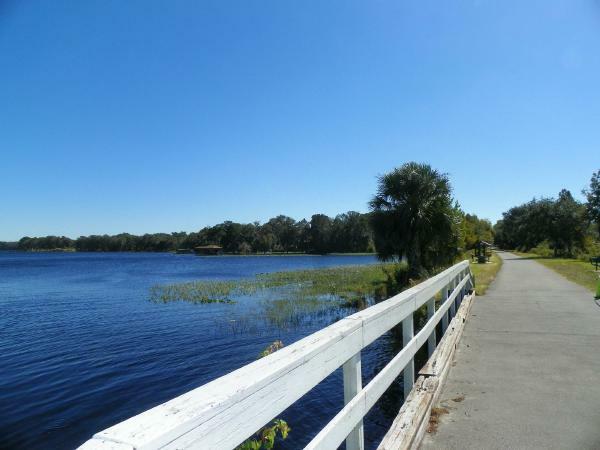 The Withlacoochee State Trail is a 46 mile long paved multi-use trail that runs from its southern terminus along US301 in Pasco County, north through Hernando and Citrus Counties to its northern trailhead near Dunnellon. We have included three of its major access point locations on our map so that each of the three counties it traverses will be represented. In addition to the three we highlight, there are numerous other places where you may begin your journey on the Withlacoochee State Trail - many with ample parking, restrooms, and other facilities. The Trail occupies right-of-way that was originally used by Henry Plant's historic railroad in the late 1800's. Through the years it was used by the Atlantic Coast Line, the Searboard Coast Line, and CSX Transportation. However, in 1989 CSX sold the right-of-way for 46 miles between Gulf Junction and Owensboro Junction to the State of Florida to establish the Withlacoochee State Trail, under the Florida "Rails to Trails" program. The almost entirely level trail runs through many small, quaint, historic towns, as well as through desnsely forested areas. It is entirely paved and suitable for hiking, bicycling, or rollerblading. Horseback riding is permitted along a dirt path that runs parallel to the Withlacoochee Trail. Parking for vehicles with horse trailers is provided at the Ridge Manor, Citrus Springs, and Gulf Junction trailheads. Due to the large number of access points, the Withlacoochee State Trail is suitable for all skill levels of hikers, rollerbladers and bicyclists. Long distance riders can enjoy great distances without having to worry with vehicular traffic. And those with more restricted abilities, or families with young children, can access the Trail at a number of state, county, or community parks where other facilities are available. Many biking groups enjoy the journey from one small town to another, with a rest stop for lunch at a local restaurant. The Trail runs through or near the towns of Trilby, NObleton, Istachatta, Floral City, Inverness, Hernando, Citrus Springs and Dunnellon - all spaced just a few miles apart from each other.